Whether you’ve never seen the ever-regenerating dance troupe Pilobolus, or you’ve seen them so many times that you think you’re done–this is a very good year to watch the company at the American Dance Festival. The Pils and ADF go back together to the beginning of time (at least, to the beginning of Pilobolus), and it is easy to feel jaded about their annual re-appearance in the ADF summer season. And like any long-lived entity, Pilobolus has had times when it was less brilliant–but this is not one of them. The current group of dancers has that special magic together, and each dancer exhibits the full splendor of the Pilobolus style. Yes, it is the most expensive ticket of the season, but you will absolutely get your money’s worth. The program length was listed as 105 minutes–but that was before they added in a new work, and it does not include the onstage pre-show warm-ups. 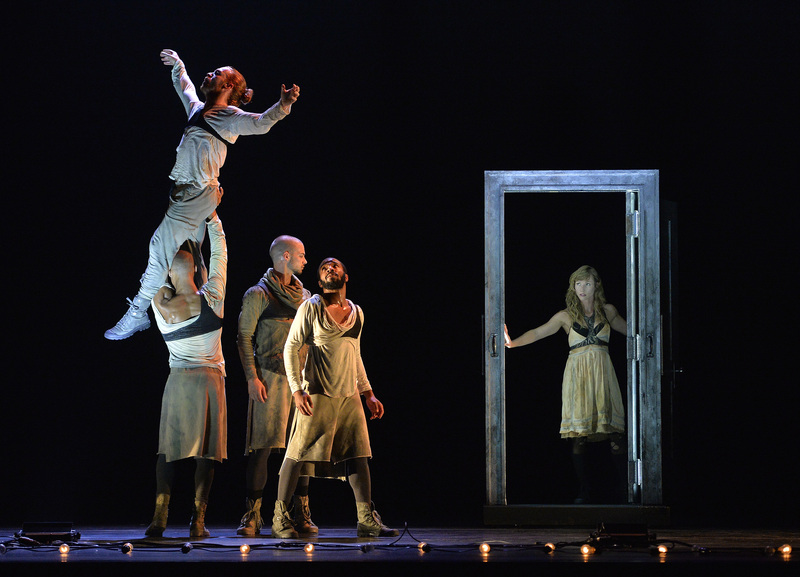 The show presented June 30th in DPAC repeats July 1 at 7 p.m.
Friday night saw the world premiere of yet another ADF-commissioned piece, Echo in the Valley, for which Pilobolus collaborated with the world’s greatest banjo duo, Bela Fleck and Abigail Washburn. This is a very dark work for the company, and unusually narrative, with scenes of struggle and death in Appalachian coal mining country (the bad old days, dark as a dungeon way down in the mine). The staging is fantastic, with piercing lighting by Thom Weaver, and clogging boards set up with amplification for both Washburn (she and Fleck play on stage) and the dancers. Who are wearing shoes! When Heather Jeane Favretto stepped up and began clogging, I nearly fell out of my seat. Talk about trying something new! Holy clogging Piloboleans! (And check out Washburn’s double rhythm when she dances at the microphone.) The music is great–a mix of atmospheric riffs and bursts, with some of the old songs, which Washburn burns into the listener with her amazing voice, ranging from pure high lonesome to scorching gravel in the space of a phrase. Also burned into memory is a long scene in which the giant dancer Jacob Michael Warren looms in frozen mourning over his dead beloved, the violence in his soul contained until his friend tries to draw him away. The friend takes a beating, but really, he has given the only gift of love that can provide solace to the mourning miner–some place to release his rage. Echo in the Valley is profoundly moving. The program opens with the very beautiful 2014 work On the Nature of Things (ADF co-commission). Two men, one woman and a raised circular stand–and Vivaldi. Three magnificent human bodies doing graceful, impossible things in as little clothing as the law allows. The performance on the 30th was phenomenal, with Antoine Banks-Sullivan, Nathaniel Buchsbaum and Krystal Butler. Ms. Butler is ALL THAT. The troupe added into the program a new work called Branches, in which they appear as a flock of birds, with scenes from dawn to sunset. It was completely delightful and made an excellent bridge between On the Nature of Things and Echo in the Valley. I expect this piece will become a program regular, it is just so much fun to watch people become birds. And speaking as a person who spends a lot of time watching birds being birds, I can say that Pilobolus gets the behaviors just right. After intermission comes the clever [esc], which is really a magic act. Once before was more than enough of this piece for me–I really have a hard time with a woman being bound with duct tape and a plastic bag taped over her head. Even knowing she’s going to escape, it makes me sick. The other tricks are not upsetting, but still, once you’ve seen them, you’ve seen them. However, once is not enough for the 2007 piece Rushes, one of the early collaborations by Pilobolus with makers outside the company, in this case, Inbal Pinto and Avshalom Pollak. It involves a dozen small white chairs, a white floor circle, six dancers and a suitcase, and a harmonious mix of the most unlikely musical bedfellows. Rushes evokes so many things, most of which have to do with journeying–and seeking and hiding and finding; escaping and rescuing and surviving. I had remembered it quite well, but it burst upon me afresh with this spectacular cast, who carry out their amazing feats of balance, strength, endurance and grace with gorgeous vitality, imbuing the resolutely non-verbal composition with visual and kinetic clarity. Pilobolus performing Rushes at ADF, 6/30/17, in the DPAC. The mystical lighting is by Yoann Tivoli. Photo: Ben McKeown. No one could have known, when planning this season’s American Dance Festival schedule, that when the summer of ’16 rolled around, we’d all be living a nightmare struggle, toting our little bundles of hope through hoop after hoop of danger and depravity, looking for love, looking for home, for self and for safety. But these artists, you know they run ahead of the curve. So with Pilobolus and Shadowland. The dream begins in SHADOWLAND, the evening-length piece by Pilobolus that opened ADF 2016. At the DPAC through 6/18. Photo: Grant Halverson. “We are such stuff as dreams are made on; and our little life is rounded with a sleep.” Pilobolus dances a dark tempest in SHADOWLAND, as ADF opens its 2016 season. Photo: Grant Halverson. With Shadowland, Pilobolus has taken visual ideas we have seen earlier, in rawer states, to confidently developed presentation. For 8 or 10 years, they’ve been more and more interested in creating flows of imagery independent of those they make with their bodies, and with a cinematic unreeling of flat motion-pictures. Story has also been pushing its way into the dances. This work is nonverbal, but it is a linear narrative. Along with their dancing and their famous sculptural shape making, Pilobolus adds shadow puppetry techniques and animation tropes, and exerts a cinematic aesthetic on the mix. The immediacy of the bodies is interrupted and denied so many times that eventually one gives into the exuberant imagistic flow of this dance-theatre, and appreciates it for what it is. It’s very smart, rich in reference and symbol, if just a little predictable; it’s clever and funny and ominous–but it neither grabs you in the viscera nor releases endorphins, as Pilobolus’ pure dance works have been known to do. Shadowland‘s a classic story. A very young woman, just feeling the stir of sexuality, poses and practices before a mirror. Noticed by her parents, she feels shame, and falls asleep to dream her fears and longings. There’s something of Colette’s Minne here, with her imagined adventures among the “Apaches” of the boulevards of Paris; there’s a hint of Clara from the Nutcracker, and of Alice in Wonderland, and more than a hint of Dorothy from Kansas: there’s no place like home, in the end. She’s an archetype–the sexually-budding female–and her lack of particularity allows us to view this slightly cautionary tale with a distanced calm. If some of the action had not been de-powered by its removal to two dimensions, it would have been very hard to take. There’s a lot of attempted violence against this girl, from the ubiquitous anonymous hands trying to go up her skirt, to men running at her with cleavers, to a giant figure who remakes her with a dog’s head and sends her down the road. It is exactly this distancing that I find so unsatisfying. I’ve whined about it before (as early as 2008 and 2010), but with this beautifully constructed multimedia dance-theatre work, I finally get the point. I’d rather, personally, see all bodies all the time, but this is a different kind of stage art. And what if, in addition to being a story well shown, what if this is a silent howl against the deforming gauntlet young girls endure, an objection to their objectification? What if it is a really subversive meta-statement on the struggles of real live dance against the flattening roller of electronic media? What if it is a Big Statement about loving one another, even if you’re a dog and the other is a…centaur? Vive la danse, however theatrical. Continues through 6/18; if you go, be sure to stay for the adorable after-bows encore, with bulls and rainbows. Pilobolus in SHADOWLAND, behind the screen in ADF opener at DPAC, 6/16/16. The production includes many cinematic references. Photo: Grant Halverson. Pilobolus sprang to life in 1971 from a small band of outliers, determined to make dance differently from…every other way. The collaborative group was such a success that the group has survived its original members, and generations more. No longer sprouting strangeness on the edges of the dance world, the institution of Pilobolus is instead at the center of many people’s idea of what contemporary dance is, or should be. The problem with being an institution (afloat on corporate largesse and fan expectations) is that it makes change and growth–artistic soul food–more difficult. In recent years, Pilobolus has visibly struggled with the problem of satisfying viewers and sponsors indelibly imprinted with the great dances of earlier years, while searching for ways to make new works that satisfy current times and new dancers. Their success has been mixed. They’ve brought some weak, or mediocre, or badly spliced GMO works to the stage (and this is OK, aggravating, but OK: every piece of art cannot be “the best”) but also some completely glorious new works that grow organically from the company’s sprawling underground root system. As long as there has been a Pilobolus, the company has danced at the American Dance Festival, and the ADF has had, and continues to have, a key role, through commissioning new work, in maintaining Pilobolus’ relevance. This year, the ADF commissions include one slight and excessively silly piece, and one bold and brilliant work, Thresh|Hold, both of which had their first viewings on the DPAC stage last night. In their effort to sustain their vitality, Pilobolus has for a number of years been working with a variety of outside choreographers from around the world. For Thresh|Hold, it was Venezuelan Javier de Frutos who collaborated with the company, and the result is the most directly emotional piece I’ve seen from them. Although less involved and less spectacular–less entertaining–than many of the recent new works, Thresh|Hold is more important, artistically: it slams, slithers and slices to the core of a universal experience–the torment of lost love. Pilobolus premiered the important Thresh|Hold at ADF, 6-18-15. Photo: Grant Halverson. For one woman, four men, and a door, with a powerful score by David Van Tieghem, Thresh|Hold goes into the memory of a woman as she struggles with the multi-formed man no longer hers. The authenticity of this nonverbal testimony is staggering. The door of memory changes location and swings both ways; the woman willingly enters and attempts to escape. She looks back, wrestling with brutal henchmen; she searches for their fallen angel. The door spins, the henchmen take her down, she writhes away, longing driving her towards acceptance, resignation and even a tender remembering of the time before love crashed and burned, and her man still flew with the angels. Although not as ravishingly lovely as last year’s premiere, On the Nature of Things, Thresh|Hold has more dancing, and it is hot. I half-expected to see the flames burst along the dancers’ paths, as I could feel them roaring in the woman’s head. And maybe more importantly, Thresh|Hold uses all the classically Pilobolean elements (power lifts, dragging, conglomerations, weight transfers, great lighting) in fresh ways. The evening opens with the 1991 Sweet Purgatory (an ADF commission), which I’ve always taken to be about love. It’s set to Dimitri Shostakovich’s Chamber Symphony, op. 110a (orchestral arrangement by Rudolf Barshai), and is almost ridiculously beautiful. What with the plangent strings and the piercing brass and the balancing bodies, I was wiping tears from about 30 seconds in. Any time is a good time to see this one again, but its presentation before Thresh|Hold made this a Pilobolus program that will long resonate in memory. Pilobolus dancing Sweet Purgatory at ADF, 6-18-15. Photo: Grant Halverson. The two were separated by a silly and rather patience-trying tidbit, Wednesday Morning, 11:45, which itself was preceded by one of the videos Pilobolus has been irritating audiences with for several years. Honestly–we are in a live theater, we do not need self-promoting videos between the acts, like ads on TV. Fortunately, the company did not place one of these advertorials between Thresh|Hold and the glorious and well-loved Day Two (1980, original direction by Moses Pendleton), which closed the program. There was an actual intermission, during which one could talk about the work with one’s friends. The creation story as told in (the King James Version of) the Old Testament says that on the second day, God commanded: “Let there be a firmament in the midst of the waters, and let it divide the waters from the waters.” Unrecorded in any history, Goddess Gaia must have said on that day: “and let all the creatures rise and play, each in its special way.” It’s all here, in Day Two, with the lovely cool lagniappe of the encore as a blessed bonus on a hot night. Pilobolus in Day Two, at ADF 6-18-15. Photo: Grant Halverson. The program repeats June 19 (8 pm) and 20 (7 pm), in the Durham Peforming Arts Center. Ticket info here. Up next, beginning Sunday, June 21 in Reynolds, Heidi Latsky Dance.